In a relaxing atmosphere (soft lighting), beauticians (trained to Thermes Marins de Saint-Malo treatment protocols) welcome guests in warm, spacious treatment rooms. Facial treatments, body treatments, world body modelages, contouring … we meet all your demands! 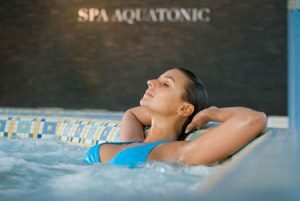 Group lessons or personalized training programs, the Spa Aquatonic® fitness zone adapts to the clients rhythm: getting back into shape, a sporting break, or just the pleasure of the effort … Moments to harmonize body and mind with one objective: vitality! This concept is particularly suited to urban fitness centers who want to differentiate themselves from their competitors by offering more comprehensive benefits that include physical activities, but also body treatments, water aerobics, aquatic relaxation, thus expanding their customer base. New product concepts can be developed, such as fitness and slimming/contouring.